Pattaya United’s Serbian striker Milos Stojanovic (centre) fights for the ball with Navy defenders during the first half of the Thai Premier League game between Pattaya United and Siam Navy FC at the Sattahip Navy Stadium in Sattahip, Sunday, Sept. 17. 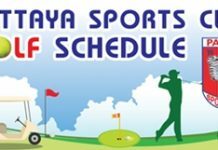 Pattaya United’s run of five consecutive league victories was brought to a dramatic end by close neighbours Siam Navy FC in Sattahip last Sunday. 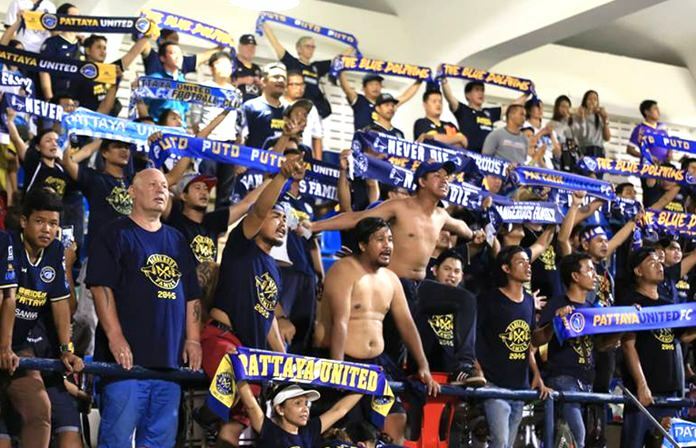 Leading 2-0 with just over 20 minutes remaining in the game, United appeared destined for a sixth successive Thai Premier League win but a combination of defensive errors and a ‘never say die’ attitude by the home team saw that advantage wiped out by the final whistle. Dolphins supporters cheer the team despite the late setback in Sattahip. 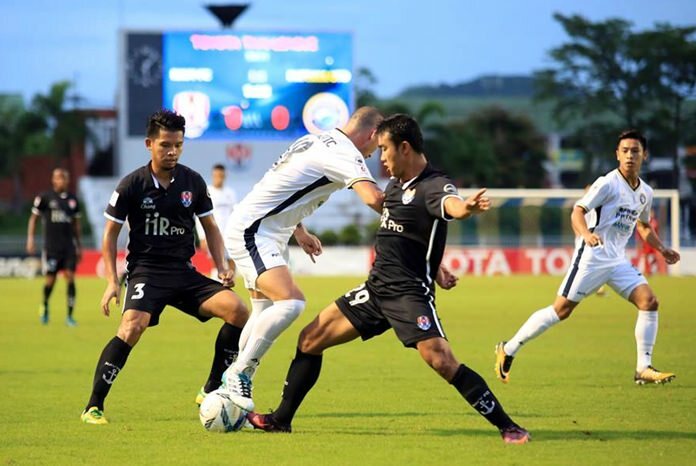 Coming into the game off the back of an inspiring victory over high-flying Bangkok United the previous weekend, the Pattaya squad was full of confidence and that self-belief was on show as they edged the first half in Sattahip despite being unable to find a decisive breakthrough. The best chance of the opening 45 minutes fell to United’s Serbian striker Milos Stojanovic but he put a free header wide of the Satthip goal from close range. Stojanovic would atone for his earlier miss when he gave United the lead 10 minutes into the second half. Picha U-Tra skipped his way to the byline and cut the ball back for Stojanovic to fire the ball low into the far corner of the Sattahip net and in the process notch his 11th goal of the season. Worse was to follow for the home team as they fell further behind in the 68th minute. United’s Tossakrai flicked the ball towards goal from a corner kick and Navy keeper Wongthongkam could only flap at it helplessly, allowing the Dolphins other Serb import Aleksandar Jevtiæ to tap in from 2 yards out. United’s visiting fans were already starting to celebrate another league victory when the course of the game changed in the 82nd minute. Some lax marking in the Pattaya defence allowed midfielder Suttipong Laoporn time and space to fire the ball home at the second time of asking past Dolphins goalkeeper Patiwat Khammai. The home team now sensed a momentum shift and they poured forward searching for an equalizer. It came in unconventional fashion with 2 minutes of normal time remaining as Dolphins defender Won-Young Lee steered the ball into his own net for an own goal as he tried to cut out a dangerous left wing cross. The turnabout in the final 10 minutes of the match at Navy certainly took the wind out of United’s sails as their winning streak came to an abrupt end. They will be hoping to get back on the victory trail this coming Sunday though when they take on Port FC at the Nongrue Stadium in Pattaya. Kick-off is scheduled for 7 p.m.